Abstract. We examined the changes to global net primary production (NPP), vegetation biomass carbon (VegC), and soil organic carbon (SOC) estimated by six global vegetation models (GVMs) obtained from the Inter-Sectoral Impact Model Intercomparison Project. Simulation results were obtained using five global climate models (GCMs) forced with four representative concentration pathway (RCP) scenarios. 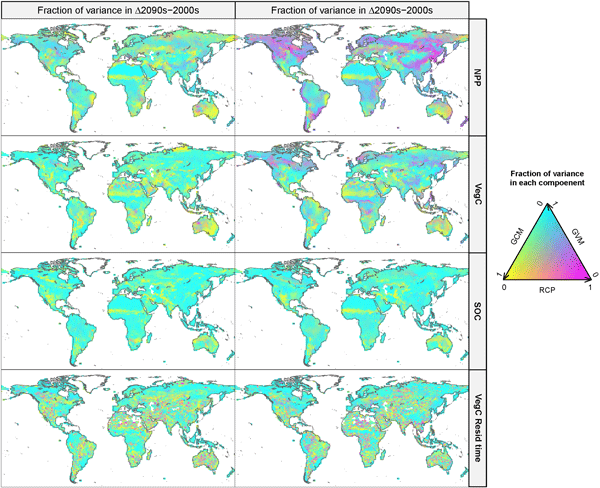 To clarify which component (i.e., emission scenarios, climate projections, or global vegetation models) contributes the most to uncertainties in projected global terrestrial C cycling by 2100, analysis of variance (ANOVA) and wavelet clustering were applied to 70 projected simulation sets. At the end of the simulation period, changes from the year 2000 in all three variables varied considerably from net negative to positive values. ANOVA revealed that the main sources of uncertainty are different among variables and depend on the projection period. We determined that in the global VegC and SOC projections, GVMs are the main influence on uncertainties (60 % and 90 %, respectively) rather than climate-driving scenarios (RCPs and GCMs). Moreover, the divergence of changes in vegetation carbon residence times is dominated by GVM uncertainty, particularly in the latter half of the 21st century. In addition, we found that the contribution of each uncertainty source is spatiotemporally heterogeneous and it differs among the GVM variables. The dominant uncertainty source for changes in NPP and VegC varies along the climatic gradient. The contribution of GVM to the uncertainty decreases as the climate division becomes cooler (from ca. 80 % in the equatorial division to 40 % in the snow division). Our results suggest that to assess climate change impacts on global ecosystem C cycling among each RCP scenario, the long-term C dynamics within the ecosystems (i.e., vegetation turnover and soil decomposition) are more critical factors than photosynthetic processes. 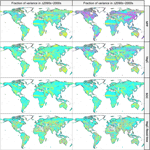 The different trends in the contribution of uncertainty sources in each variable among climate divisions indicate that improvement of GVMs based on climate division or biome type will be effective. On the other hand, in dry regions, GCMs are the dominant uncertainty source in climate impact assessments of vegetation and soil C dynamics. How to cite: Nishina, K., Ito, A., Falloon, P., Friend, A. D., Beerling, D. J., Ciais, P., Clark, D. B., Kahana, R., Kato, E., Lucht, W., Lomas, M., Pavlick, R., Schaphoff, S., Warszawaski, L., and Yokohata, T.: Decomposing uncertainties in the future terrestrial carbon budget associated with emission scenarios, climate projections, and ecosystem simulations using the ISI-MIP results, Earth Syst. Dynam., 6, 435-445, https://doi.org/10.5194/esd-6-435-2015, 2015. Our study focused on uncertainties in terrestrial C cycling under newly developed scenarios with CMIP5. This study presents first results for examining relative uncertainties of projected terrestrial C cycling in multiple projection components. Only using our new model inter-comparison project data sets enables us to evaluate various uncertainty sources in projection periods. The information on relative uncertainties is useful for climate science and climate change impact evaluation.